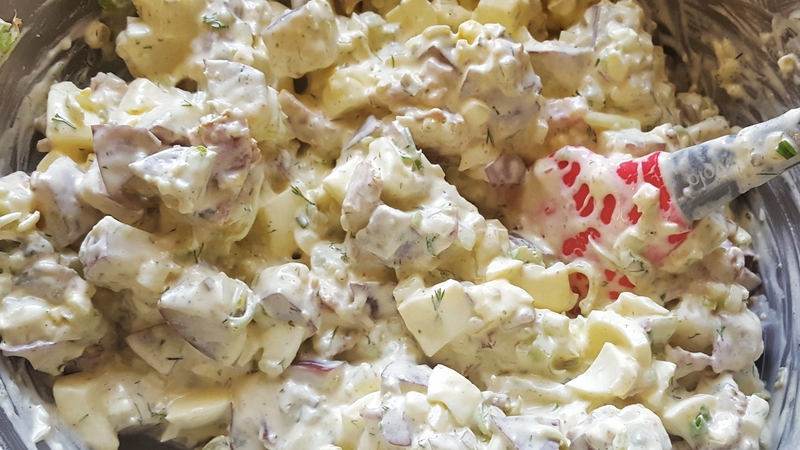 At the last-minute yesterday, I decided we needed potato salad at our cookout. Luckily, electric pressure cooker to the rescue. Four minutes cooking time, about 10 minutes prep. I left potatoes and eggs in the fridge to cool while we ran around. Added mayo, mustard, some dill pickle juice just before dinner and served with grilled hamburgers and corn. Yum. Add the steaming basket to the pressure cooker. Add cubed potatoes (and you don’t need to be too fancy with cutting the pieces – just relatively same size for uniform cooking). Place washed eggs on top of the potatoes. Close the unit, set to steam for 4 minutes. When finished, use the rapid release method to ensure eggs don’t over cook and potatoes stay firm. Add eggs to a cold water ice bath. Remove potatoes and drain excess water. Add to large serving bowl. Peel eggs, wash and cube. Add to potatoes. Let cool completely before mixing so as not to turn the potatoes into mush. Once cooled, add remaining ingredients and fold until well mixed. Let sit for about 10 minutes before serving.